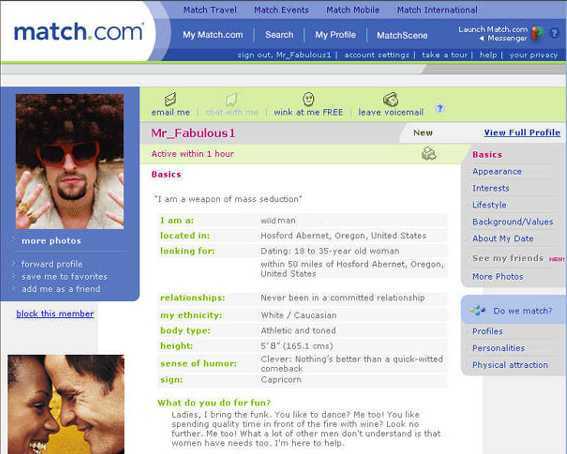 That’s right; we are still building a Match.com profile together. Isn’t it fun? And thank God, this is the last part. I took a short break there because it is just so exhausting filling out these things (plus I had a date with Suz and you have to have priorities…) If you missed earlier parts of this, scroll on down! Now to the real deal; who you gonna date? First, they give you the option of only seeing matches who have photos. I highly recommend checking that option. In fact, I require it! Anyone that cannot add a picture isn’t probably intelligent enough for you to go out with. (I know, you’re desperate to get laid, take a cold shower and settle down). How tall should she be? Ok, the default is really stupid. I just don’t know that you’d be particularly happy if a 3’2” person did email you. Of course on the other hand, she’d probably have a promising circus career. Good bonus points for financial stability; but no, VE says don’t go there. Same with the Amazon women over 6 feet. Sure, you want to conquer the big quests, trust me, they will think you a little man no matter what. And that won’t be isolated to your height there buddy; unless you have something to really prove them with; stay away. What kind of hair do you like to run your fingers through? Hey, bald is on there. Fairs fair I guess. But seriously, unless you’re hanging down at the cancer ward what is the likelihood of actually meeting a bald woman? Exactly. With women choosing so many different hair color dyes these days, better just select “any” unless you just have some obsession for red heads or something. Certain ethnicities? Hmm…no cannibalistic pygmies to select so I guess that would fall under “Other” right there with actual aliens. You won’t find “honky” on there, it’s under White / Caucasian. Like anyone is actually white anyway! What’s her faith? If you will refer back to the previous posts, this is one to stay away from. You’ll see it in all of their free form text information. “I thank God, I’m desperate enough to have to use these web sites” or “God is smiling on me as I substitute my 400lb photo with the one when I was 13 and was just going to go on those birth control pills which ballooned me out big time never mind the fact that I ate more meals at fast food places than the guy from Supersize me. No, just put “Any”. Then you can manually filter. Are you picky about her education? Yeah, I know. If she’s like really dumb. Like George W. dumb, she won’t even be able to pick up your six pack of beer from the store while the game is on. Better get at least a high school education there. Watch out for those PhDs and graduate degrees though. They probably owe about as much to their tuition as the USA owes on its national debt. How often do your dates drink? I know, you just care whether they get inebriated and loose. But you can't get there if they don’t drink at all. Again, just select regular or social drinker. Are you looking for someone who’s previously been married or in a committed relationship? Don’t you have to be committed (aka crazy) to start down that road in the first place? Does your match have any children? Children age women! Children age men for that matter. Those that say none; hey, they are bonus material. They can go out whenever! The ones that say Yes and they live away from home. Almost as good, but you have to watch out for summer vacations and you have to question why they don’t have the little trouble makers in the first place. You might not want to go down that road! Does she want kids? Don’t actually answer this one. You can screen it later. It’s a no win question. What turns you on….and off? Erotica? Score!!! Oh, if you don’t know what a Brainiac is, you’re not and therefore if that is their turn on…forget it. Also, I don’t know what the phenomenon is about skinny dipping, but they all have that as a turn on. Like you see thousands of people skinny dipping on a regular basis. When was the last time you actually went skinny dipping past your college and pot smoking years? I thought so. Don’t ask me; it’s a mystery (stole that from a movie too). There you have it. Perfectly guided to find your dream woman. The only thing between you and them are the ingenious uses of digital photography and some long winded drivel that you write in the free form section after you fill out this. Get out there and get ‘em! Guess you score, I skinny dipped this summer. Sorry you weren't around.